When is a cultural powerhouse not a cultural powerhouse? When that cultural powerhouse is Manchester, alas. No one doubts that this bustling, bulging, biggety metropolis, Britain’s second most populous urban sprawl after London, is a player on various cultural fronts. If you like theatre, you have the Royal Exchange. If you like music, you’re spoilt for choice: the old ones can listen to the Hallé at Bridgewater Hall and the young ones can be inspired by Joy Division, the Smiths, the Stone Roses, Oasis. Dammit, even Herman’s Hermits were from Manchester. Why, then, does the feeling persist that the city of Engels has not been punching its cultural weight? It was something I fretted about on the train up to the recurrent arts festival they mount here. Culturally, this great city and its ambitious international festival ought biennially to feel like the centre of the universe. But, until now, it hasn’t. Manchester International Festival (MIF) launched in 2007. Its USP is that it’s a festival consisting entirely of bold new commissions. In the past, the birthing mum has duly given us Damon Albarn’s first Chinese opera and the first choir music of Ennio Morricone, Kraftwerk at the Manchester Velodrome and a baroque music pavilion by Zaha Hadid. All that was inventive and exciting. But it was also temporary and intangible. Spread across all the arts, assembled internationally from many bits, MIF has never quite managed to feel like a solid achievement. This year’s incarnation is again guilty of the sense of transience that comes with the territory of MIF. But there are also encouraging signs of anchorage. The opening event this time eschewed the creative vagary that the Björks and the Albarns have brought to previous MIFs by turning to the people of Manchester for its mood and its message. Set in Piccadilly Gardens, devised by the ever-quotidian Jeremy Deller, What Is the City but the People? 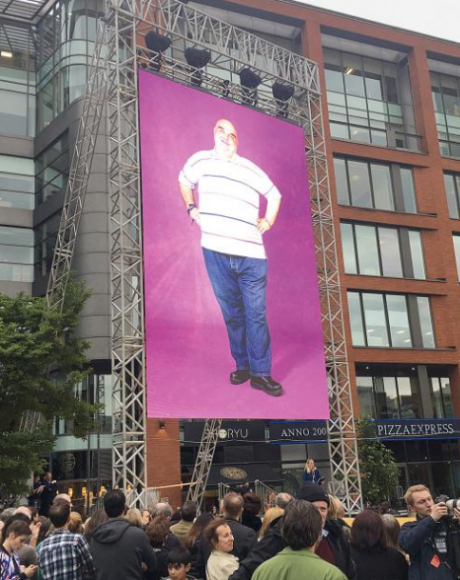 was nothing more complicated than a parade of Manchester folk and their stories, but it was mounted with real care and precision, and it did something to me that hasn’t happened at MIF before. It made me cry. Lifted above the urban mess of Piccadilly Gardens was a bright yellow catwalk, down which marched a mixed bag of Mancunians with a tale to tell. They came in all shapes, sizes and ages, and as each of them began their catwalk strut, a set of elegant video portraits told us who they were. Stefan, the first up, was a Big Issue North seller. Vincenzo, the fat one, was a refuse collector. “If you’re happy he emptied the bin, he’s happy he emptied the bin,” the caption said as Vincenzo strode down the Yellow Brick Road, waving graciously in the manner of Elizabeth R.
The taxi driver who turned off his meter on the night of the Manchester bombing was there. So was Mickie, who used to drive a truck in the army, and who’s just turned 100. James was born last week. Kate was born Andrew. Bruce was always lonely, but the organisers of this giant metropolitan hug-in arranged for him to meet Frankie on the catwalk, on a blind date. For MIF, we can flit from Susan Hefuna’s paper-thin Egyptian minimalism to Raqib Shaw’s ornate Hindu reworkings of the Old Masters; from John Akomfrah’s beautiful cinematic lament on the desecration of the oceans to a pair of film tributes by Stephen Sutcliffe and Graham Eatough to the farting Mancunian bellyacher Anthony Burgess. The international stuff is entertaining, yes. But it’s the disinterment of the Burgess that feels as if it needed to happen here. It was the taxi driver who got me sobbing. Pretty much everyone who followed topped up the tears. This was the Manchester I remember from my years studying art history at the university here — tough, gritty, soppy Madchester, where the jokes come thick and fast, and so do the smackings; where they try to blow you up, but can’t, because there’s nothing the IRA or Isis or any disconnected brutalist can do to crush the spirit of the city. What’s been missing from the Manchester International Festival? This has. Previous MIFs have surprised me with their strange musical cast. Although I admire Ennio Morricone, there’s something intrinsically incoherent about the voice of the spaghetti western echoing through Salford and Cheadle. As for the cetacean wailing of Björk, it sounds better if you’re actually in Iceland. And why, I ask myself, in a city that gave us Oasis and Happy Mondays, is Damon Albarn from Blur the one who keeps being invited back to mount another multimedia spectacular? The feeling persisted that the internationalism of the festival was trumping the efforts of the locals. But not on this occasion. At the top of this year’s mix is a sequence of events centred on New Order, the pioneering Mancunian electro-thumpers who flavoured dance music with weighty dollops of Mitteleuropean angst. Since their first incarnation as Joy Division, there have been several versions of New Order. The one playing a set of themed concerts at MIF 2017 has one original member left, the taciturn Bernard Sumner. But as with all true musical breakthroughs, the sound of New Order is so big and tangible that it no longer depends on personnel. So It Goes, as the homecoming is called, takes place in the cavernous Granada Studios, where Joy Division made their TV debut in 1978. There is no more perfect setting for a New Order concert than this gigantic industrial hangar round the corner from the ruined remains of the Rover’s Return. Granada has now moved its operations to Salford, and these old studios are going to be developed into the Factory, a mega-arts centre, planned for 2020, that should finally turn Manchester into the cultural powerhouse it yearns to be. Billed as “a collaboration with the artist” Liam Gillick, whom regular readers of this column will recognise by his sobriquet of “Britain’s most boring artist”, So It Goes is basically a New Order gig set against a Gillick backcloth. With his love of industrial flatness and his duff polytechnic thinking, Gillick can usually kill an aesthetic pleasure from a continent away. Here, however, his wall of hi-tech prison cells, in which is incarcerated a 12-strong synthesizer orchestra from the Royal Northern College of Music, makes something even bigger and more symphonic out of New Order’s Wagnerian pop. The music was momentous. And, as if to prove that a drop of Mancunian nostalgia will soften the hardest heart, they even mixed in a couple of Joy Division songs. New Order are as renowned for their art as for their music, which makes them a rich festival topic. From the beginning, their output was thrust into the hands of the brilliant graphic designer Peter Saville, whose memorable album covers somehow married the austerity of minimalism with the doomy symbolism of the fin de siècle. 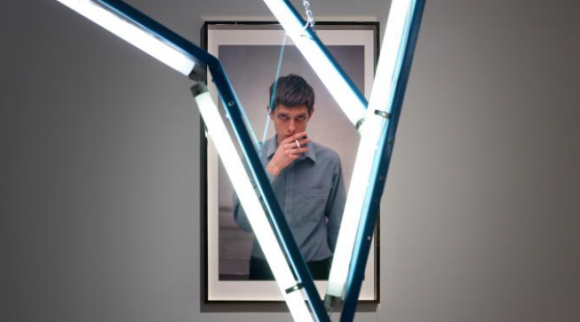 The results are examined in True Faith, at the Manchester City Art Gallery, a show that is both a look back at New Order’s artistic legacy and a tribute to them from artists inspired by their music — Julian Schnabel, Glenn Brown, Martin Boyce and the aforementioned Gillick. Saville’s album covers are fascinating and rousing. So is the treasure trove of concert footage and archive. The disappointment here is the tribute art. Only Boyce, the former Turner winner who dots the show with an eerie copse of neon trees, looks as if he has produced art that chimes in any meaningful way with the music. Over at the Whitworth Art Gallery, a clutch of lively displays curated by Maria Balshaw, the new director of Tate, makes quickly clear why she earned her big promotion. Her strategy at the Whitworth is to treat every gallery as if it were a separate exhibition. It’s a way of arranging art that engineers surprises around corners. In one museum, you get a dozen shows. At Tate, where some of the onus is on providing a coherent narrative — the story of British art, for example — she will have to modify the approach. But here it works a treat.